The Challenge: Children who live in lower-income communities and communities of color are more likely to be overweight or obese than White children and children from more affluent backgrounds. They also are likelier to live in neighborhoods with barriers to physical activity such as lower-quality sidewalks, fewer parks and greater danger from crime and traffic. Regular physical activity can improve health and reduce the risk of obesity. Make an impact: Walkable neighborhoods; safe, clean, and attractive environments; and access to parks and recreational resources can encourage physical activity among all groups, including those at high risk for obesity. What the findings are about: This synthesis examines the growing body of evidence showing that racial and ethnic minority and lower-income communities often lack environments that support physical activity. Racial and ethnic minority and lower-income youth tend to get less recreational physical activity than White youth or youth from higher-income families. Racial and ethnic minority and lower-income people are more likely to live in neighborhoods that lack resources, safety and aesthetic appeal that promote walking and other physical activities. Policy makers should pursue strategies that improve walkability; access to parks, green space and recreational facilities; and neighborhood safety for ethnic minority and lower-income communities. 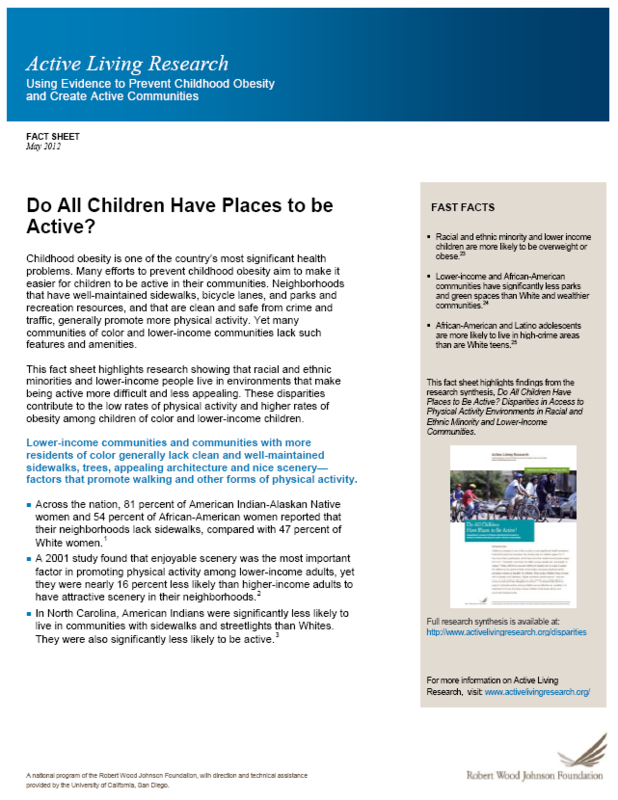 An abbreviated Fact Sheet, Do All Children Have Places to Be Active? (May 2012), is available that highlights the research synthesis' main findings. 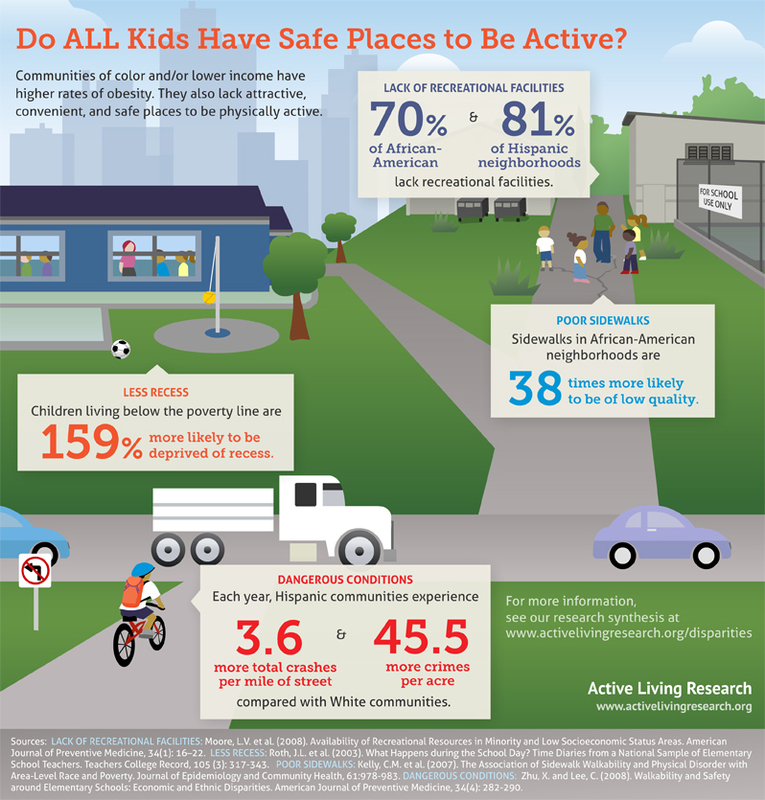 Findings presented in this brief are also available in the related Do All Kids Have Safe Places to Be Active? 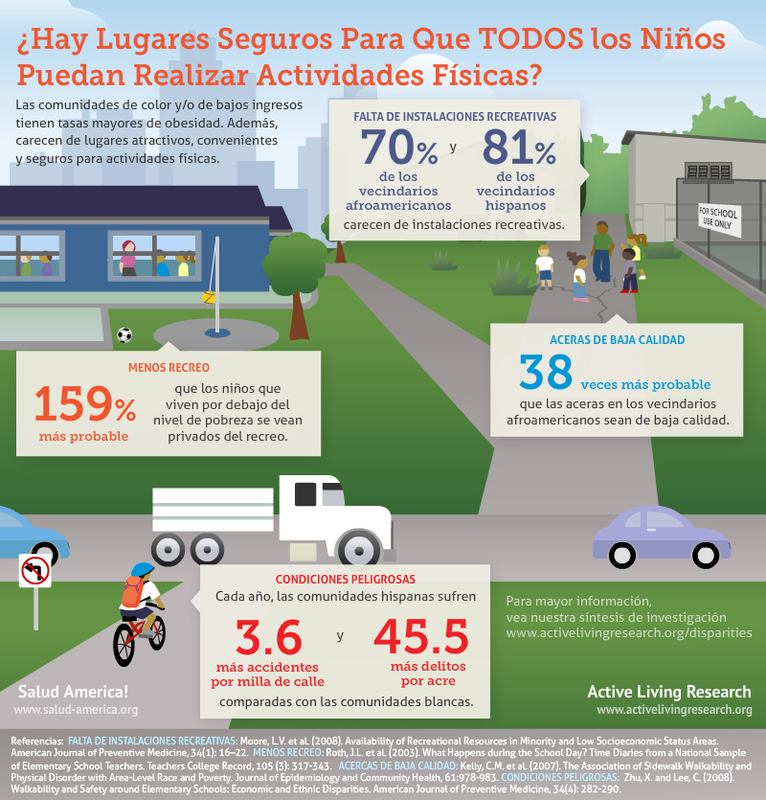 infographic, available in English and Spanish. Taylor W and Lou D. Do All Children Have Places to Be Active? Disparities in Access to Physical Activity Environments in Racial and Ethnic Minority and Lower-Income Communities. A Research Synthesis. Princeton, NJ: Active Living Research, a National Program of the Robert Wood Johnson Foundation; November 2011. Available from: www.activelivingresearch.org.